Landscape Painter. Born in Bentzen, Germany on February 20, 1865. Wendt immigrated to Chicago in 1880 and studied briefly at the Art Institute of Chicago while working a commercial art shop. A self-taught painter, he became a great technician through his power of observation. Wendt was a good friend of artist Gardner Symons in Chicago and made several trips to Southern California with him between 1894 and 1906. After his marriage to sculptress Julia Bracken in 1906, the couple moved to Los Angeles and bought the studio home of the Wachtels on Sichel Street. 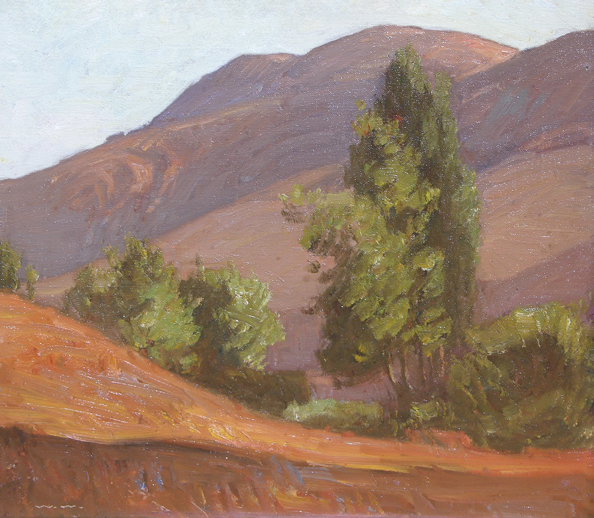 Wendt was a cofounder and first president of the California Art Club in 1911 and he held the position for six years. In 1912, he was elected an Associate of the National Academy. In that same year, he built a studio home in Laguna Beach. Before 1915, his paintings were characterized by light, short strokes. After that time, he used a much broader, bolder brush. Eugen Neuhaus wrote, "He sings of spring in its rich greens and more often of the joyful quality of summer in typical tawny browns, in decorative broad terms." Wendt's reputation continues to soar. 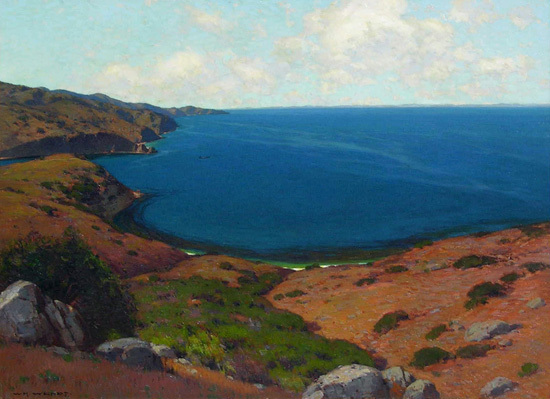 In 2008, the Laguna Art Museum presented a show featuring some of Wendt's major paintings. A renowned art historian Dr. Will South co-authored an important book for the show, "In Nature's Temple: The Life and Art of William Wendt". It is great contribution to American art history. Wendt is considered a giant among American Artists and is often referred to as "The Dean of Southern California." He died in Laguna Beach on December 29, 1946. Awards: Dozens from 1893 including bronze medal, Buffalo Expo, 1901; silver medal, St. Louis Expo, 1904; silver medal, Panama Pacific International Exposition, 1915; grand prize, Panama-California International Expo, San Diego, 1915; Ranger prize, National Academy of Design, 1926. Works Held: Union Club, Seattle; Herron Art Institute, Indianapolis; Cliff Dwellers Club, Chicago; Art Institute of Chicago; Cincinnati Art Museum; Laguna Museum; Los Angeles County Museum of Art; Pasadena Art Institute; Pasadena Art Museum; Springville (UT) Museum; Irvine Museum, CA; Fleischer Museum, Scottsdale, AZ.